After the critical and commercial success of The Wrestler, writer-director Darren Aronofsky pivots from the wrestling ring to the ballet studio, and from a battered Mickey Rourke to the delicate Natalie Portman. She plays a New York City ballerina whose demanding and lecherous director (Vincent Cassel) awards her a starring dual role—as the virginal "White Swan" and the sensual "Black Swan"—in his new interpretation of Swan Lake. 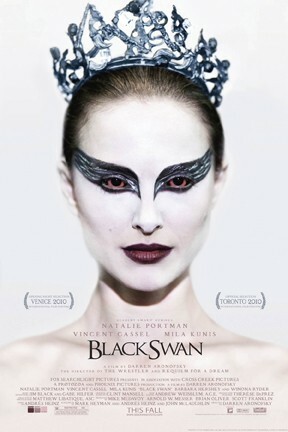 Buffeted by her jealous mother (Barbara Hershey), her backstabbing understudy (Mila Kunis), and a frigid perfectionism that badly inhibits her performance as the Black Swan, the dancer begins to melt down as only an Aronofsky character can. The black/white duality isn't terribly interesting, but as in most of Aronofsky's films, an intense horror of the body and its uncontrollability fuels the rhapsodic psychodrama (2010). Jonathon Statham claims his place once again as a kool kat action hero, while Anthony Hopkins arrives as a creepy man of the cloth, it's all at the movies. Black Swan is not showing in any theaters in the area.